Jammu, Apr 14: Prof. Bhim Singh, Chief Patron JKNPP & a Sr. Member of Supreme Court Bar Association expressed shock on Prime Minister, Modi's statement he made in Kathua, J&K this morning that the PM forgot to mention BJP's candidate in Udhampur Lok Sabha contest besides the PM failed to mention the failures of the BJP Govt. During its 16 years rule in India. 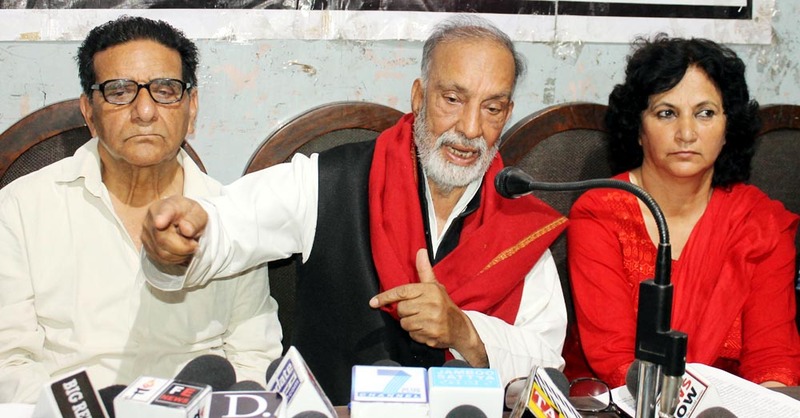 Prof. Bhim Singh expressed shock that a Prime Minister while speaking to the Voters of Jammu & Kashmir in Kathua completely forgot to mention that Jammu & Kashmir did not have tricolour flag rather is having a separate flag and the Constitution. The Prime Minister also forgot to mention the earlier blunders of the Congress govt. and present blunders by his own government. Prof. Bhim Singh strongly criticized the Prime Minister for omitting the Instrument of Accession which was signed by Maharaja Hari Singh on 26th October, 1947 yet three subjects which Maharaja acceded to the Union of India have not been included into legislative jurisdiction by the Parliament of India which has been under the control of BJP for 16 years. Prof. Bhim Singh accused the Prime Minister of India for his utter failure to expose the majority parties in the Parliament since 1950 till today (Congress & present rulers). NPP Supremo accused the Congress and the BJP who ruled the country for several years for ignoring to seek Constitutional measures to bring an end to the so called Jammu & Kashmir problem through the Parliament of India. NPP Supremo expressed surprise that Prime Minister in his own speeches he made in Akhnoor on 29.03.2019 and in Kathua this morning did not say a word about extension of Constitution of India to the entire state of Jammu & Kashmir by the application of the Instrument of Accession as was done in respect of 575 states in 1949 thus giving birth to the Union of India. Jammu & Kashmir was kept out by the Congress and now by the BJP. Neither the Congress nor BJP has ever exposed the Anglo-American Bloc which planting Dixon Plan in 1951 vis-a-vis J&K to create communal divide. Why BJP follows the Congress in this regard? Are both following old CIA plan to dissect India on communal lines? Prof. Bhim Singh called on the Voters in Jammu & Kashmir to defeat both the Congress as well as the BJP during the present Lok Sabha elections so that Indian Flag shall fly in the entire state of Jammu & Kashmir and the Constitution shall govern the state with all Fundamental Rights. He accused both the Congress and BJP for their blunders committed vis-a-vis Jammu & Kashmir during their rustic and corrupt rule.